This recipe was inspired by my new email friend, Sophia. She’s a teenage cook who has been doing a lot of baking lately for her friends and family. Recently, Sophia’s mom mentioned an old recipe from childhood where chocolate was rolled up pinwheel style inside peanut butter cookie dough. Sophia asked if I had any recipes for this type of cookie, but I didn’t. I did find one that sounded good, though. Sophia tried it and gave the cookies a big thumbs up. Like a big fat copycat, I had to try the cookies myself. Sophia was right! They’re excellent! They’re sturdy enough to pack in a lunch box and pretty enough to serve at a luncheon or cookie exchange. In fact, if you see a cookie exchange in your future, you might want to bookmark this. Cream butter and sugar. Beat in peanut butter, vanilla and egg. Add baking soda and salt, stir until well distributed, then add flour and stir until it is absorbed. Chill dough for 45 minutes (no longer). Divide chilled dough in half. On a lightly floured surface roll each half into 10 X 8 inch rectangle and spread each rectangle with half the chocolate mixture, stopping about ½ inch from sides. Using a sharp knife, cut into 1/4 inch slices. Place 1 1/2 inches apart on a lightly greased baking sheet. Bake at 375 degrees for 10-12 minutes of until lightly browned. Transfer to wire rack to cool. My grandmother made a pinwheel from an old McCall’s recipe (may have been a specific advertiser) from back in 1950’s or early 60’s. I’ve lost it thru 30 yrs of military moves but this one looks very similar but her’s had a bit of Orange Zest in the dough and the log was shaped more oval for easier slicing. Thanks for bringing back a long lost smile in honor of Gramma Despres. HMMM PEANUT BUTTER . THESE LOOK GREAT. There’s only one sugar. I fixed that. I had it in my mind there were two as I typed the instructions, but there was only one. I was just about to start making these when I noticed it says to cream both sugars. I only see brown sugar in the list. How much white sugar am I supposed to use? Today is Back to School here in NC and I thought they’d make a nice treat for the girls when they come home from school. I wish I had this recipe last Christmas. Jackie, thanks for the skull cookie link. Maybe I’ll make some for my friend Patty. She’s from Mexico. Belated birthday greetings to Emma. We were in Disney World and Atlanta. The cookies look great. On a similar theme you might want to try these. http://www.101cookbooks.com/archives/000123.html Last year my Emma had a mean Spanish teacher and her only redeeming feature was she would give extra credit if you brought in food. So I made several different cookies and brownies for Emma to take in. I made the cookies in the link for Dia de Los Muertos and they were a big hit. They are a little bit fiddly but if I can manage it then anyone can. They are really tasty and look amazing. I think it might become a tradition to make them every year. My mom declared that they looked just like the ones she remembered and my dad (who doesn’t really like peanut butter) declared them “not a bad cookie” so I must say that they were a wonderful success and second the encouragment to them. I made these and gave them out at Christmas – they were a big hit! Those look adorable. What a great addition to a cookie tray! 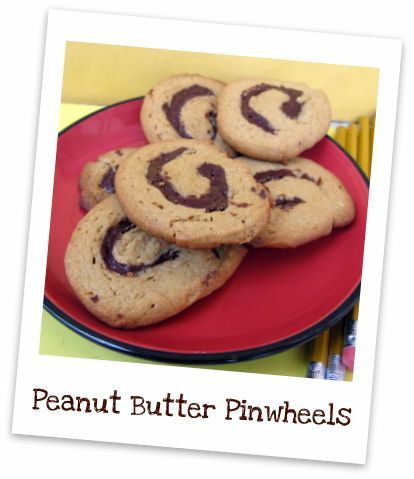 So those are the Peanut Butter Pinwheels that Sophia was referring to! 🙂 They’re attractive and it’s nice to know they taste good too. Welcome, Sophia. Leave it to Anna to find an idea for your cookie. And she is not a fat copycat. Two of my favorites…they are so perfect looking! Yum, thanks! Good old PB & Chocolate combo! Yum. And they ARE pretty. Printing now….